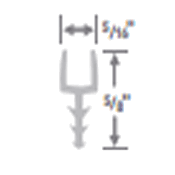 Try the Johnsonite 1/8" resilient floor reducer to eliminate abrupt changes in flooring levels and to safeguard your home or work space. 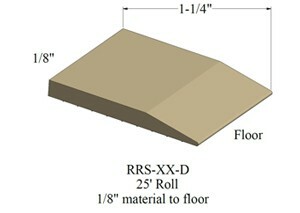 This transition strip is a 1 1/4" wide vinyl floor reducer to go from 1/8" resilient floor to flush (subfloor). Its durability, easy installation, color, and profile variety make this product a great choice for your floor transition needs at home and work. This Johnsonite product is available in 27 Standard Colors. This floor reducer meets the performance and design requirements of the ADA. This reducer is not stocked in our warehouse; please allow 1 to 3 weeks for delivery (depending upon availability). 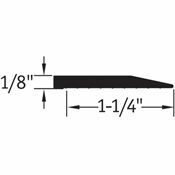 This flooring reducer may be glued down with Transition Adhesive. See the Transition Strip Installation Video for help during the process of installing your flooring transition. Please Note: Every monitor displays colors differently. The colors seen on this website may not accurately depict the actual colors of the products. Request Color & Transition Samples here. Select color and quantity of 25 foot rolls below.